Published: July 8, 2013 at 05:36 p.m. 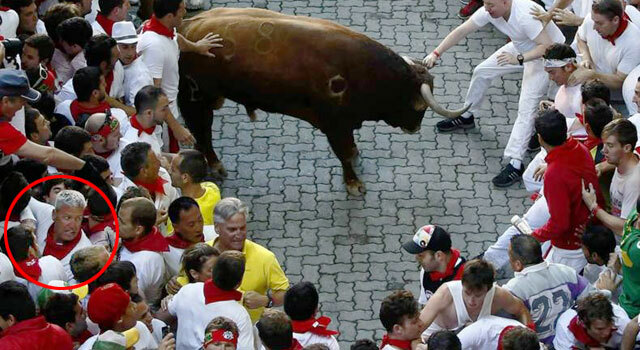 Updated: July 9, 2013 at 01:49 p.m.
New York Jets coach Rex Ryan avoids a charging bull at the running of the bulls in Pamplona, Spain. Bombastic New York Jets coach Rex Ryan provided a window into his philosophy of life two years ago when he merged Teddy Roosevelt and Babe Ruth into one swaggering demigod. "They talk about walk softly and carry a big stick. I love that. I agree with that 100 percent," Ryan said. "But I guess I feel more like Babe Ruth. I'm going to walk softly, I'm going to carry that big stick and then I'm going to point and then I'm going to hit it over the fence." Much like his father, Rex never is one to hold back -- be it with an incendiary quote or an adrenaline-fueled adventure. He tackled the latter on Sunday and Monday, joining the annual running of the bulls at the San Fermin festival in Pamplona, Spain. The video footage shows Ryan struggling to climb a fence at the same rate one might run from disaster in a typical nightmare. In an often buttoned-up NFL, though, we can appreciate Rex's special brand of lunacy. He's an original.